Tree Cozy, India is a companion piece to Tree Cozy in Cleveland, OH. Like the US tree, it is a natural object representing masculinity and strength covered with a crocheted cozy representing femininity and comfort. On the most obvious level, it is a piece of clothing, personifying the tree and keeping it cozy and colorful throughout the year, enhancing the beauty of nature. The cozy softens the strong tree form while also emphasizing it. It simultaneously caresses and encases the tree. The cozy covering the tree fluctuates between comforting blanket and suffocating cover-up; it conceals as much as it protects; it hides as much as it reveals. This is all the more pertinent because it was an American who blanketed the indigenous Indian tree. 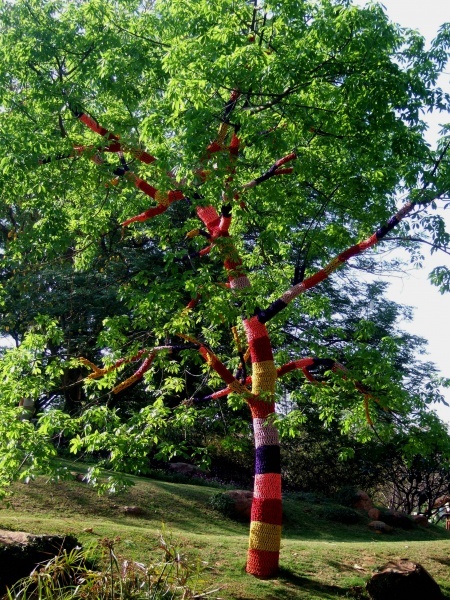 Tree Cozy, India is located at Global Arts Village, New Delhi, India.